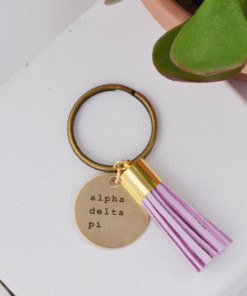 The perfect gift for new members, bigs and littles or just for a sister you love and appreciate. 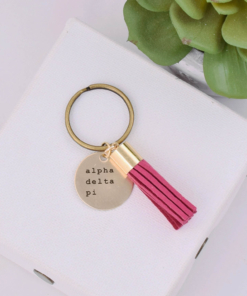 This suede leather tassel keychain comes in your choice of 12 stylish colors with your chosen sorority name engraved on a brass charm. 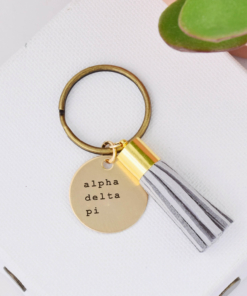 If you don’t see your sorority listed, type your requested organization name into the “Custom Text” box above. Our #1 Bestseller! 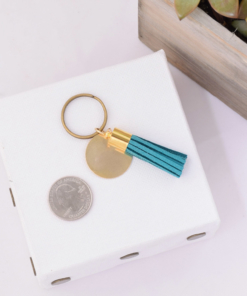 These keychains are made out of high-quality suede leather and antiqued brass. 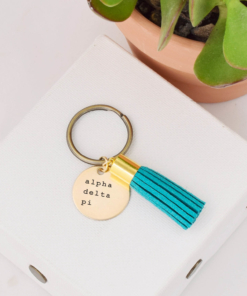 The full keychain measures 2 ½ inches long with the tassels measuring 1 ½ inch long. 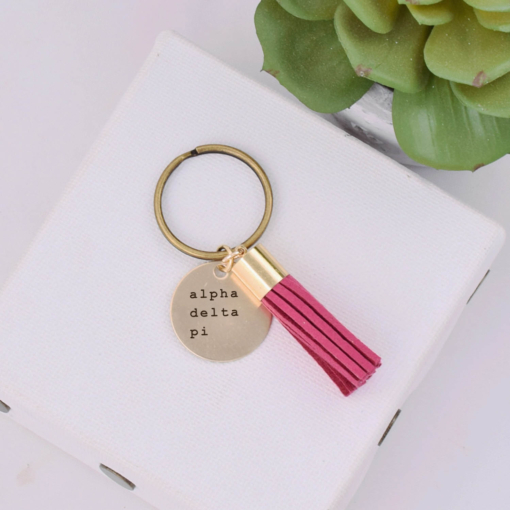 The brass disc charm with the name of your chosen sorority laser engraved in a typewriter font will be 1 inch round. 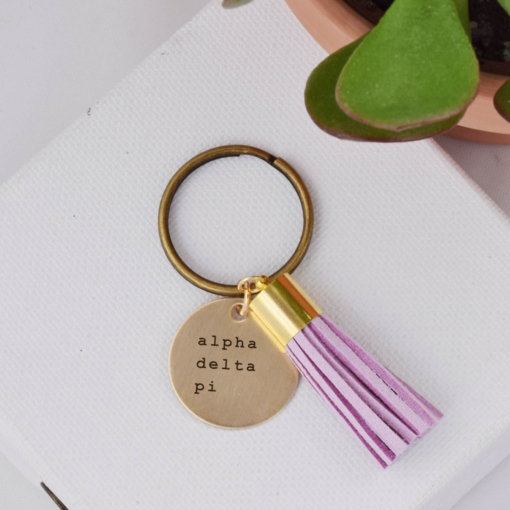 The tassels and charm will hang off a 1 inch round brass keyring. 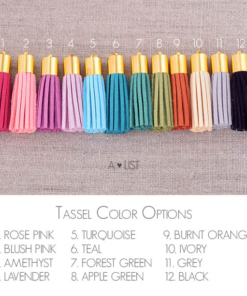 All of our products are made to order, so choose your favorite tassel color and your sorority from the drop-down menus above and leave the rest up to us. We custom design and handcraft every product right here in our Southern California workshop. 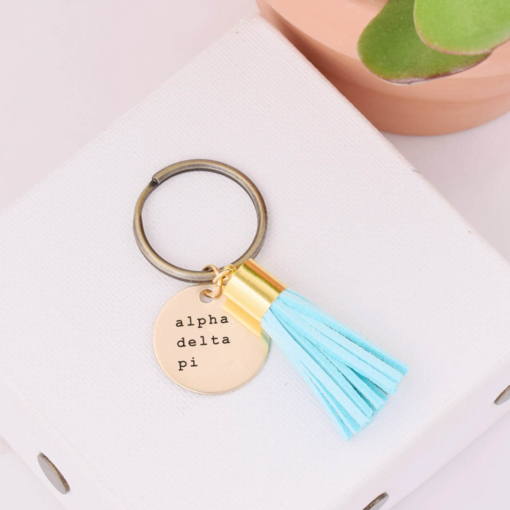 “Cutest keychain ever! 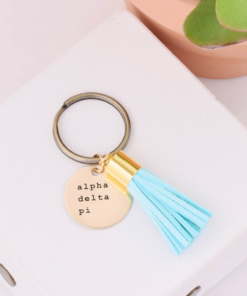 My daughter loved it!” -5 out of 5 stars from S.S.
“Beautiful and they threw in Aoii hair ties!” -5 out of 5 stars from K.S. 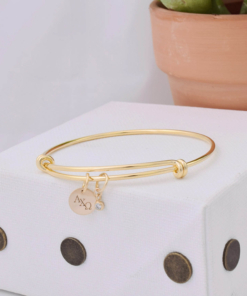 “SO CUTE! 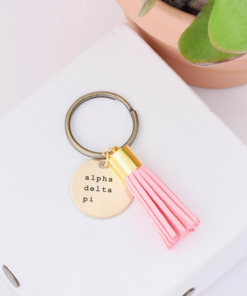 I got them for my little and cannot wait to give it to her. Perfect to use as a keychain on car keys” -5 out of 5 stars from L.B. Being sorority women ourselves, we founded A-List Greek in Southern California in 2013 and have hand designed and handcrafted each product in our Orange County workshop since. We take pride in our high-quality and durable materials as well as our dedication to our customers and making each order custom and special for them. 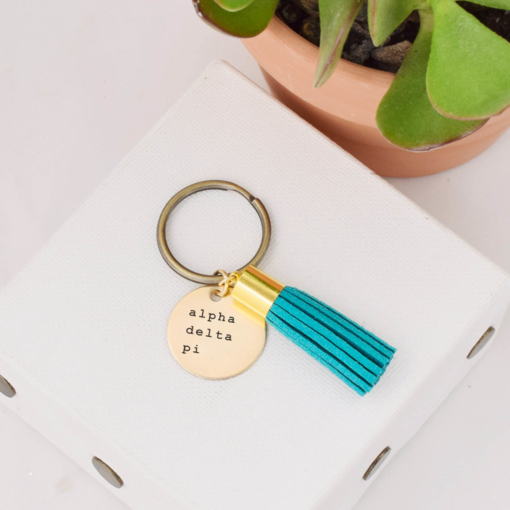 We package all of our sorority tassel keychains in our custom A-List Greek packaging that includes a custom designed packing card, care instructions and a free with purchase hair tie with the name of your sorority. 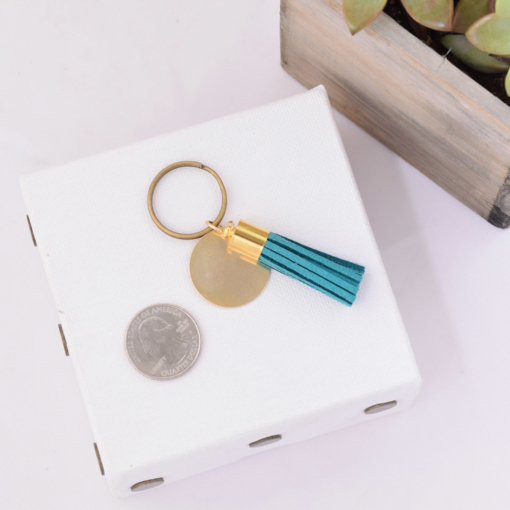 If this keychain is a gift and you would like to make it a little extra special, you have the option to upgrade the packaging to a velvet tied gift box. These shipped so quickly, I cannot believe it! 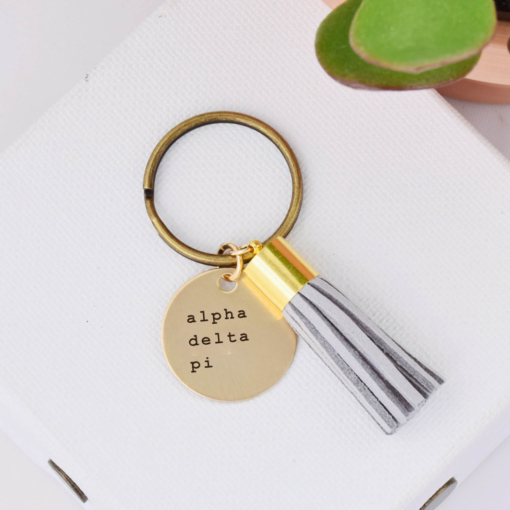 I ordered them Sunday night, received a personal email from Hope double checking some specific info about my particular order on Monday afternoon, and received the keychains Wednesday. I live in NYC, so the fact that they shipped them out from CA was no small feat. I’m really happy with the order too. The colors are true to the picture. 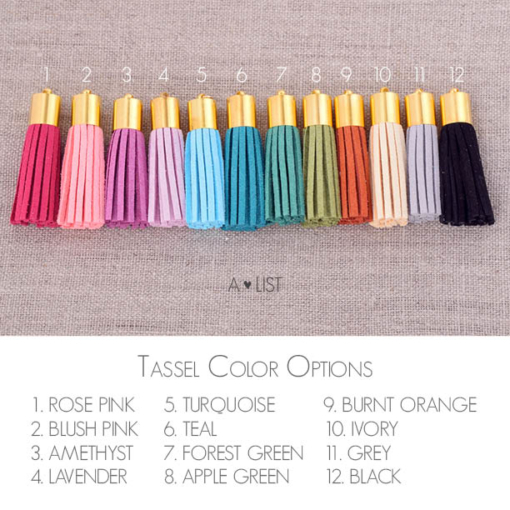 I love them and want to order more now! !